Year round, Express Yourself introduces and immerses young people into the world of music, dance, theater, and visual art with transformative results. Through artistic expression, youth move from a place of isolation to one of belonging and learn to use a variety of creative means to express themselves in positive and healthy ways. In the process, young people discover and develop inner strengths and gain a greater sense of connection with others. All of this work culminates in the annual Express Yourself showcase presented in collaboration with the Department of Mental Health. 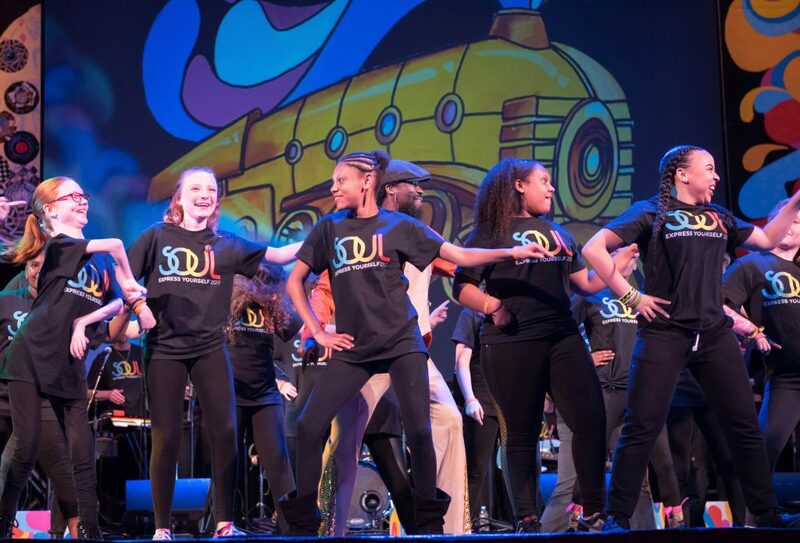 At this year’s 23rd annual showcase, over 200 young people performed at Boston’s Boch Center – Wang Theater. They entertained an enthusiastic audience sporting festive glow stick necklaces and bracelets. Celebrating this year’s “SOUL” theme, the program featured set pieces designed by youth as well as a medley of singing, drumming, and dance performances. The showcase also featured guest performances by Afro-Brazilian percussionist Marcus Santos, Cammie Griffin and John Angeles of “STOMP”, funk soul, reggae singer Toussaint Liberator, Boston Children’s Chorus, Joyspring Community Chorus (directed by Jonathan Singleton) and West African Master Drummer Joh Camara.